It was on the first of many days spent traipsing leisurely around Anthropologie with my sister that it first dawned on me that buying things for my kitchen made me happier than buying things for my wardrobe. At 19/20, I felt like this was not something I should openly admit, confiding only in my family and close friends. Even before this moment in the history of my retail habits, I had been teased for my excitement over car boot sales and charity shop bric-a-brac, picking up egg cups and old cutlery, for, what people mocked, my 'bottom drawer'. Living at home with my parents still, I had very little use or need for these things, unless i was to transform my bedroom into an intimate cafe. I'm the sort of person who would probably buy a baby's outfit for fear of not finding it again when I actually came to need it. Hopefully it won't come to that though. Anthropologie is an American brand, which came over to England at just the right time in my life. I can spend an hour, quite easily, walking around the vast wonderland of enchanting floors, picking up bowls, flicking through books, smelling hand soaps and stroking the bedding. Everything is really unique and made with care. Some collections are collaborated with designers, others are seasonal and some stock is rotated all year round. They have more minimal products like pale or plain crockery which is inoffensive and easy to incorporate into any kitchen/home. Then they have a more bohemian selection of things, with brightly coloured patterns, prints and block colouring, which I imagine fitting in nicely with a hippy dippy home or at a picnic in the Spring. Their designers travel the world for inspiration and to broaden the range, uncovering special products and collaborating with unique artists from all over the world to influence new collections. All of their products are sourced both locally and from all over the world. Some of my favourite pieces include handmade stoneware, hand glazed pottery and hand painted items where no two are the same. I have a hand painted fruit bowl that I took about 25 minutes to choose, as each one was unique in its own way and even more brilliant because of it. Their stock is always changing, but there are also continued items too - carried through each collection - like cereal bowls, glasses, mugs and food storage. It's reassuring to know if you break something, you'll quite easily be able to replace it, or if your housemates start stealing your favourite mug (that's aimed at you, Wiggins), then you can tell them where to go. Quite literally. Best For: Mugs, plates, bowls, table linen, candles and gifts. 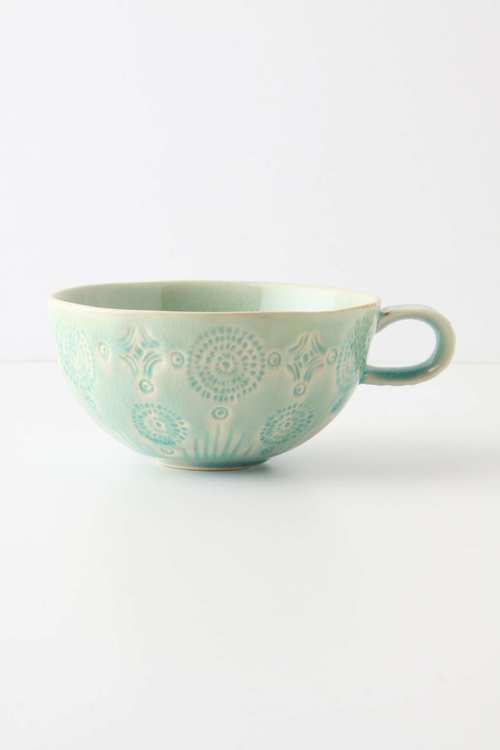 If in doubt, Anthropologie will always have something to suit even the most difficult person to buy for. Personalised Alphabet plates or mugs, if nothing else. Simple. Bath, Regent Street, Kings Road, Santa Monica, West Broadway & Chelsea Market, New York.